The cornerstone of any IT system is the database technology being used. And in today’s world of 24×7, real-time connectivity, you need a technology that meets all of your demands, without sacrificing other areas like performance, availability, scalability or consistency. 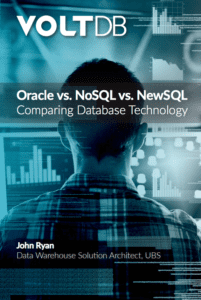 In this eBook, author John Ryan dives into the pros and cons of various database technologies and explores some key considerations to think about when choosing a database for your real-time requirements. eBook authored by John Ryan, Data Warehouse Solution Architect at UBS.